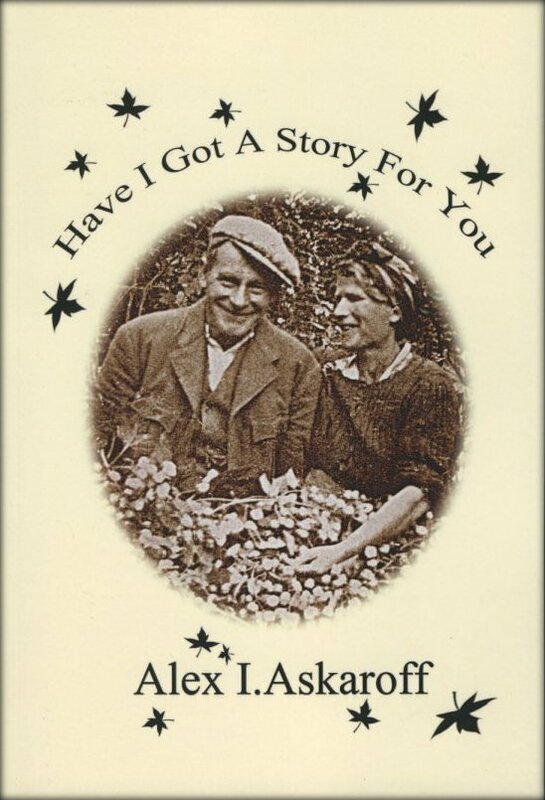 Alex Askaroff has spent a lifetime in the sewing industry and is considered one of the foremost experts of pioneering machines and their inventors. He has written extensively for trade magazines, radio, television, books and publications worldwide. Over the last few decades 'the sewing machine guru' has been painstakingly building this website to encourage enthusiasts around the Globe to collect and treasure old sewing machines. Forging metal has been a skill shared by peoples and cultures across the world for millennia. In 1850s America, as the fires of civil war rumbled ever closer, Isaac Singer and his business partner, Edward Clark had taken that skill and turned it into an art form. They went on to perfect the forging of metal to bring us the first exceptional sewing machine in the world, the Singer Model A. They also used cutting edge technologies to build factories, marching ever forward to become the largest multinational sewing machine company the world had ever seen. By 1865, as the final weapons of war in America fell silent, Isaac Singer and Edward Clark were ushering in mechanization on a global scale. They had also done it again, designing and building another amazing sewing machine. It would become a universal success, the fabulous Singer New Family Model 12. It would change the lives of millions and usher in a new era of mass production. The factories needed to build this beauty would spread, firstly across America, then Europe, starting in Mott Street, New York, expanding to Elizabethport, New Jersey in 1872. The new factories included all the infrastructure, railways and docks, warehousing and container ships. This helped to kick-start the rebuilding of a shattered country, employing thousands, and pushing America onward to eventually become the world’s first super power. 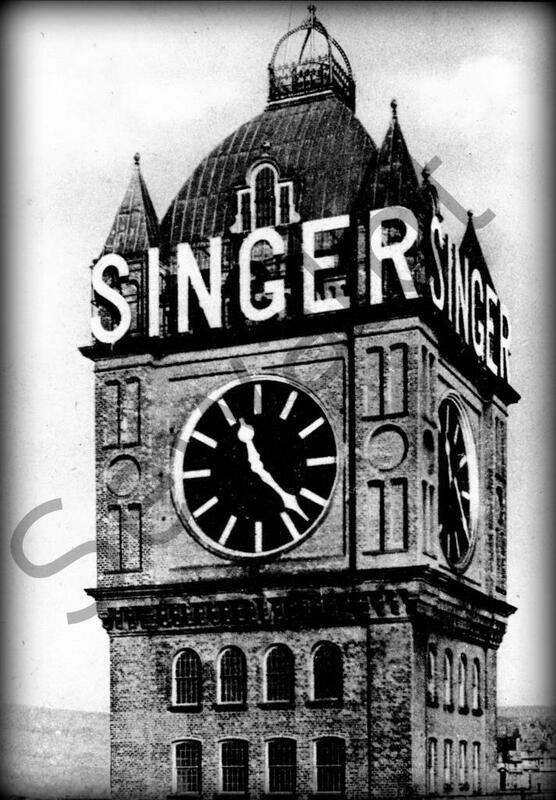 Singer factory Elizabethport New Jersey. 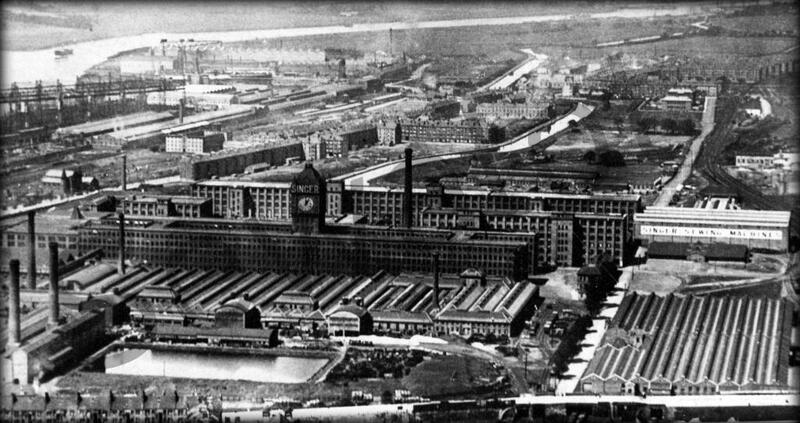 Notice how all the Singer factories were on large rivers for transport. 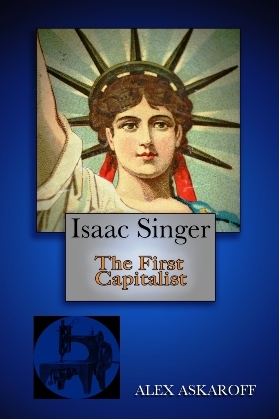 Singer would go on to invest millions (billions today), building factories around the world from Cairo, Illinois, to St. Petersburg, Russia, Monza in Italy, Wittenberg in Germany, Bonnieres on the river Seine (not far from Paris) France, Brazil and many more. The biggest of them all was at Kilbowie in Scotland. The special machines that built the sewing machines (shipped around the world from Elizabethport) were so precise that for the first time parts from any factory could be shipped to another and would integrate perfectly with the sewing machines that were being produced there. It was the first true mass production on a global scale (forty years before Henry Ford had taken his first steps to make his Model T). The Kilbowie plant, built in the cold Scottish hills, was to change a rural valley, on the side of the River Clyde, into one of the greatest powerhouses of industry on Earth, employing at its peak (just before the outbreak of WW1) an estimated 14,000 workers. It would also bring prosperity to the lives of countless other families. Mighty Kilbowie spread along the curving banks of the Forth and Clyde Canal. It became the pulsating heart of the Singer Empire. Raw pig iron went in one end of the 46 acre site and precision built engineering masterpieces poured out of the other. Eventually, by sea and rail, plane and road, they travelled across the globe to eager customers waiting with open arms. The factory lasted until Singers final death knell rang through the Scottish hills. The Singer Company had been on a boom after Edward Clark (in the 1850's) had cleverly devised the first ever official hire purchase, lay-away, part payment, or installment plan, allowing just about anybody that wanted a machine to buy a Singer. The call for their machines (that cost most of a years wages) was growing at an astronomical rate. Keeping up with this demand, from all four corners of the world, was a major problem for the first ever multinational company. The first time that the name Singer was put across the front of the machine was on the new models coming out of Kilbowie after 1883. The original idea of factories in Europe was simply to overcome the large costs of shipping heavy cast iron machines from America and to get around any import levies or duties imposed by the European powers. 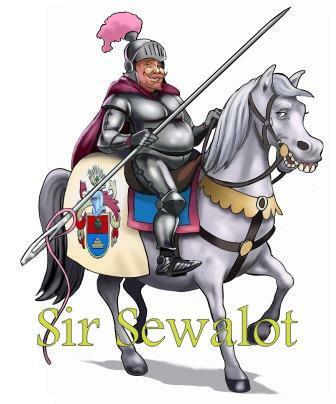 Singers very reason for choosing Scotland in the first place was to get around patents in force in England. 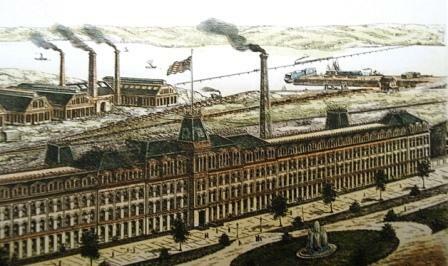 In 1866 Edward Clark's cousin had been sent on a European tour to seek out areas for new factories. He reported back to Clark who narrowed down the ideal locations and started to build small units. 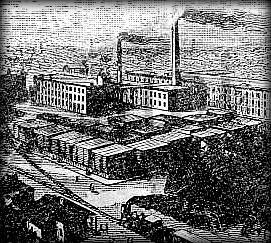 In 1867 plans were afoot by Clark to send George McKenzie (who was general manager of The Singer Sewing Machine Company and later president) to Scotland, to prepare the way for one enormous factory instead of their smaller ones. In the 1860’s, 70’s and 80’s Singer was running several smaller sites in Scotland (mainly based around Glasgow). There was a site at Love Loan that was building complete machines for European distribution (from boxed parts shipped over from America). 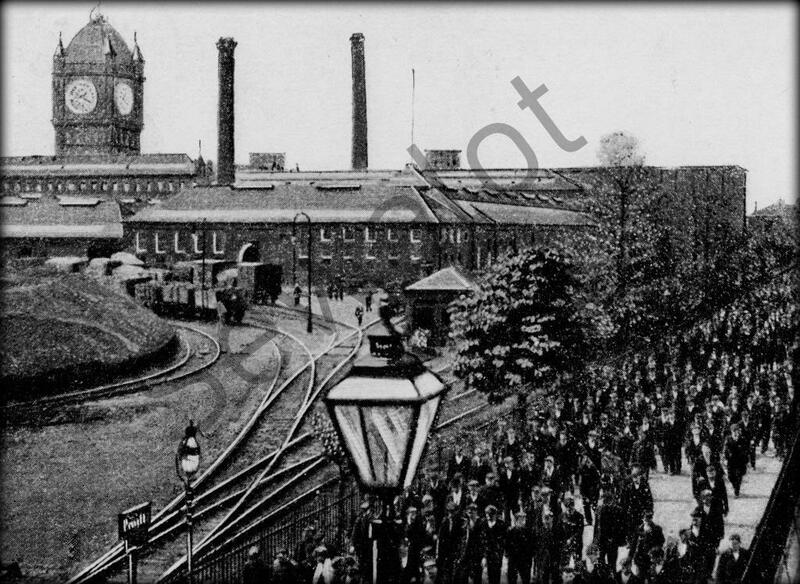 There was the Bridgeton Site (opened in 1871) which actually made complete industrial models (plus the model 12 and 13 ‘New family’). There was the foundry at Bonnybridge some 20 miles away, and another at Govan Street in Glasgow. The Kilbowie site had great potential, and as McKenzie was of Scottish descent, he was perfect for the job. The plan was simple, integrate all these smaller plants into one perfect sewing machine manufactory, capable of expanding with the market. The last meeting at Oldway of Isaac Merritt Singer, George Ross McKenzie and Inslee Hopper. Isaac died shortly after this photo. The factory needed as many natural resources as possible and Kilbowie offered these in abundance. Coal, steel, and seemingly endless forests for the cabinet makers to craft the wooden shells of the sewing machines. Then there was the mighty River Clyde, where huge ships could carry Singers stock across the world. Access to railways from the city of Glasgow and major road links to the rest of the country were another bonus. An explosion in growth was to happen to the tiny rural hamlet after the first sod was lifted with a silver spade by George McKenzie in the spring of 1882. The factory would be powered by the latest 'cutting edge' steam technology. Puffing chimneys would replace the tall pines and steel rails would bring screeching trains shuddering in 24hrs a day. 780 automated machines would cut and make the screws, nuts and bolts, 180 more would make just the needles. Huge tubs of whale oil would quench and harden the hot steel shafts. Every facet of production would be handled in one massive plant with 57 separate departments and over two million square feet of factory floor. Some workers found themselves walking up to 20 miles a day, to, from, and around the gargantuan plant. As the Singer model 12 went into production a population boom was to follow as farmer's sons left the hard toil of the land for the heavy thumping of the anvils, and the pouring of molten iron. The Singer models, 13, 15, and 17, soon followed, all for the first time with the Singer name emblazoned across the arm of the machine. The Singer model 15 went on to become the best selling (and copied) sewing machine of all time. End of shift at the Singer factory in Kilbowie, 14,000 people walked by the enormous clock tower every working day. The main contract for building the plant was won by McAlpine's with their first major contract. Robert McAlpine soon split with his partner (Richmond) and took the contract on alone, using over 20 million bricks from his own brickworks. Robert McAlpine later built his company into Britain's largest road builders. The Kilbowie plant would not only have the latest machinery inside but was protected by fireproof walls of brick, iron and steel, incorporating a full sprinkler system. 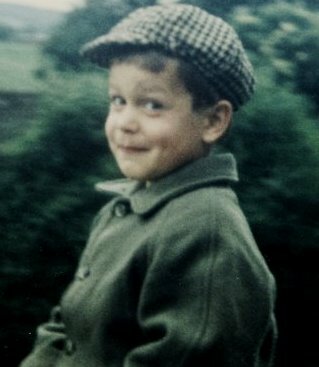 Unfortunately, Isaac Singer (the little runaway who had lived on his wits, scraping a living from the dirt) was only to see the beginnings of a mighty dream being built in the north lands of Britain. Isaac died in July of 1875 at his palace in Paignton called Oldway. However his dream did not die with him, eventually leading to one of the mightiest factories on earth. 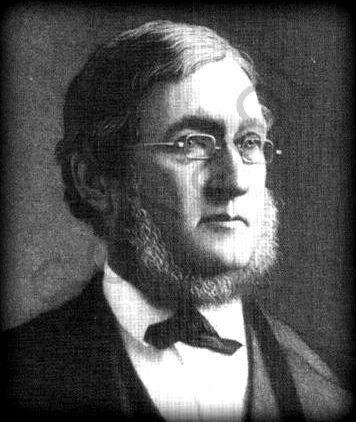 One of the final pictures of Isaac Merritt Singer. In ill health and suffering from several serious conditions, all the trials and excesses of his youth had come back to haunt his final days. He survived to see his favourite daughter married and went downhill rapidly afterwards. His full biography is below. By late 1883 the monster was breathing fire from huge melting and smelting plants as the pig iron was hauled in. The factory slowly evolved rather than opened. It didn't have the usual pomp and circumstance ceremony. Instead a giant noisily rose from the soil and kept on growing for decades. Production started slowly at first but more trains were put on to bring fresh hands to the furnaces. Adverts boasted that eventually, over one million complete machine every week were being made at Kilbowie, by a highly trained and skilled workforce unparalleled on the planet. They had their own cooks and staff, their own playing fields and sports teams, clubs and entertainment halls. All-in-all a marvel beyond all description to feed the ever-hungry demand for the humble sewing machine. Kilbowie would survive two World Wars but not the ever creeping expansion of throw-away plastic from the emerging economies. The last sewing machine came off the assembly line in June of 1980. Later that year the great factory finally closed its doors. It was abandoned, then demolished. Said to be the largest clock tower in the world, four faces 26ft wide the Singer clock was a sight to behold. The largest clock tower in the world, that summoned the whole valley to work each day, was melted down and sold as souvenir ash trays and other bits of tourist tat. Many of the workers (who had taken over from their fathers and their fathers before them), bought bits to remember the business that had brought employment to generations of working families. It was the end of an era. The end of a dream, and the end of the British sewing machine industry. Two of the finest Kilbowie Singers, the 306 and the earlier 206k (which I sew on) are both heavy duty zig-zag machines. I just wanted to drop a quick wee email to congratulate you on such a wonderfully written and informative article about the Kilbowie Singer factory. I learned a great many things about my local history and where my machine was built. Thank you for writing such an informative yet, enjoyable piece. Great work as always Alex. Keep it up. 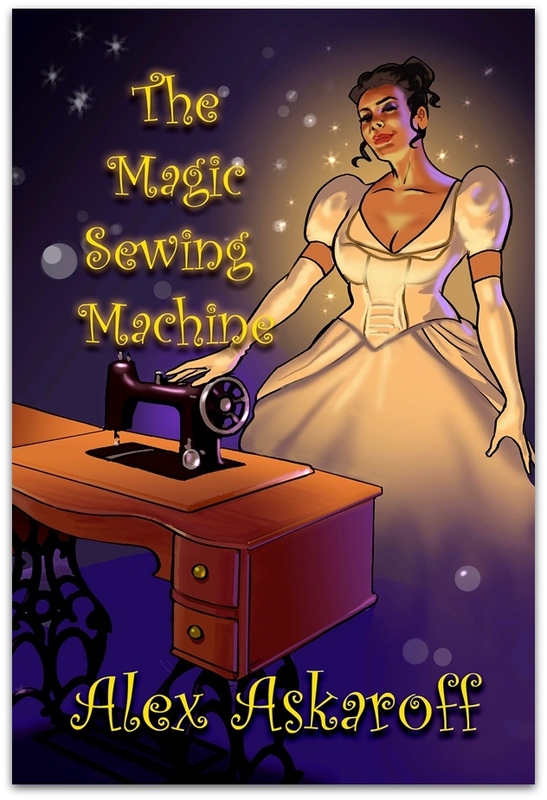 I have to say the sewing machine history saga would make a wonderful period drama. Thank you for sharing these wonderful bits of history with us! Great article...also I LOVE your informational videos on Youtube. This work of yours needs to be taken to a movie producer! I know I'd love to see it on a big screen! Thanks for sharing your wonderful work with us! Thank you Alex for sharing your hard work and knowledge with all of us enthusiastic collectors and sewers around the world!